I am honored to announce that my very first give-away is the cookbook Make-Ahead Meals for Busy Moms by Jane Doiron. Let me start by saying that Jane and I are friends. Our husbands have worked together at the same company for several years. She asked me back in April of 2009, if I would help to market her new cookbook. I am so glad that she did. I have learned so much from Jane. She is a full time elementary school teacher and the author of this amazing cookbook. She is an inspiration to me! So, you may be thinking, well how honest will she be if she actually helped to market this cookbook? Well, let me just tell you that Jane’s cookbook has honestly changed the way that I cook! Make-ahead meals can be frozen ahead, assembled ahead, or cooked ahead and reheated! The recipes in this book are a combination of all three. From Jane’s cookbook, I have tried many recipes, including the teriyaki chicken and the marinated steak. I opt to grille often, as it is a healthy way to cook, and these are flavorful, healthy recipes that I make again and again. My sons are fussy eaters that usually stick to pizza, pasta and chicken nuggets. I was thrilled when they both gobbled up their tacos. The seasonings deliver an authentic Mexican flavor. I don’t buy the pre-packaged seasonings anymore- these don’t compare to the flavor of Jane’s taco recipe. Jane suggests buying sale items in bulk in the helpful tips section of Make-Ahead Meals for Busy Moms. I now buy meats in bulk, when on sale and double the recipes. I freeze extra meals (like these marinated meats) so that I have them on-hand, ready for the grille when we are. I also buy the 93% lean hamburger meat in the big “log” (it really is cheaper than the pre-made patties). I make patties, placing waxed paper in between each patty and freeze them for future meals. This section of the cookbook has many more helpful tips for making meals ahead - like using the Reynold's Vacuum Sealer for sealing meals. I bought one and use it all the time now. It makes a noticable difference, keeping frozen meals looking and tasting great. I made the Italian Restaurant Chicken recipe shown on the cover of Make-Ahead Meals for Busy Moms. While it may look intimidating and difficult to make, I was surprised how easy it really was. The recipe calls for a few simple ingredients. Jane recommends using Parmigiano-Reggiano cheese for this recipe and conveniently provides instructions for making a portion of the recipe a day ahead. First, I browned the seasoned chicken tenders and then transferred the chicken to a large sheet pan and cooked at 400 degrees for 20 minutes. Meanwhile, I cooked the farfalle pasta as directed. In the same skillet, I cooked the garlic and tomatoes for about one minute. I added the flour, wine and spinach according to the directions. Once the spinach was wilted, I warmed the light cream in the microwave and added it to the skillet. Next, I added the cheese and mixed well. I took the chicken out of the oven and added it to the skillet- so easy! From start to finish, I made the recipe in under 45 minutes. Note-it would have taken even less time, if I made a portion of the recipe the day before! I was visiting my sister and her family that evening so I packed up this meal and brought it over for dinner. I typically don’t make recipes that are this rich - and I had a hunch this was going to be quite a treat. The Italian restaurant chicken was served over the farfalle pasta. It was no surprise to me that my sister, her husband and I all thought the meal was delicious. The cream sauce was divine! I happen to love spinach and the sun-dried tomatoes really gave the meal a gourmet flavor. We really enjoyed this meal that lives up to its Italian "Restaurant" Chicken name. Make-Ahead Meals for Busy Moms contains recipes for every meal of the day. You will find appetizers, brunch, desserts, sides and soups, in addition to main dishes. More than just a cookbook, Make-Ahead Meals for Busy Moms gives moms a new approach to cooking that will save time, money and the stress about what to have for dinner night after night. You will forget about take-out, which does not compare to Jane’s healthy, home-cooked, make-ahead meals. With the variety of 140 recipes, there is truly something for everyone’s taste in this make-ahead cookbook and I know it will change the way you cook too! Make-Ahead Meals For Busy Moms is available on Amazon.com and Barnesandnoble.com. Just one E-A-S-Y requirement for 3 entries!! PLEASE LEAVE YOUR EMAIL IN YOUR COMMENT SO I CAN REACH YOU IF YOU WIN! Giveaway will end on Tuesday, December 1. I will be using random.org to pick the winner and will post the name by noon on Dec. 1. The winner will have 48 hours to get back to me otherwise a new winner will be chosen. U.S. & Canadian entrants only. Many thanks to Jane Doiron for this review and giveaway opportunity and Good luck!!! 2. Nominate up to 9 blogs that make you feel comfy or warm inside. 3. Link to your nominees. 4. Let them know they have been nominated by commenting. 5. Link to the person from whom you received the award. 1. Millie @ My Mom's Blog by Thoroughly Modern Millie. Stop by and visit Millie- At 84 years young, Millie Garfield is one of the Internet's oldest bloggers, according to The Ageless Project. Fun Exercise- Is it Possible to Have Fun While Exercising? Do you associate the “F word” with exercise? By F Word I mean F-U-N, of course! For me, getting up at 5:30 am and dragging myself out to the treadmill for an hour, three days a week is not my idea of F-U-N. However, I continue to do it as the health benefits outweigh the punishment. To continue to the article click here. Kristi is a Freelance Writer specializing in online marketing communications. She writes press releases, web articles, media kits, brochures, web content and more. Please visit www.kristimaloney.com for more information. I recently posted an article with advice for improving your child's reading. I am currently working with my second grade son night-after-night. He reads, he stumbles, he gets frustrated. I get frustrated. Still, I am trying to foster a love a reading and to make reading as enjoyable as possible. In my research, I discovered that many parents were big fans of the Magic Tree House Series. While my son is a little young to tackle these chapter books himself, I wanted start reading the series to him to develop his interest. 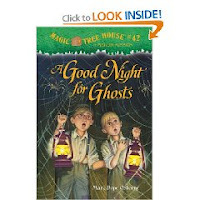 We started with the recently published A Good Night for Ghosts, #42, copyright 2009. About the Author: Mary Pope Osbourne is the author of many novels, picture books, story collections, and nonfiction books. Her bestselling Magic Tree House Series has been translated into numerous languages around the world. Highly recommended by parents and educators everywhere (and kid approved!) She and her husband, writer Will Osbourne, live in northwestern Connecticut with their two dogs, Joey and Mr. Bezo. About the Book: Osborne’s books revolve around Jack and Annie, siblings whose backyard tree house, transports them to dramatic times and places. In this story, the tree house whisks Jack and Annie off to New Orleans, 1915, where their mission is to help a young Louis Armstrong bring his gift of music to the world. A History of New Orleans Music is the magic book that guides Jack and Annie through the story. Once they meet fourteen-year-old, Louis Armstrong, ('Dipper') they tag along with him to his several back-breaking jobs on a mission to convince him to "bring his gift of music to the world." Jack and Annie learn that New Orleans is the most haunted city in America. It is the Eve of All Saints (Halloween) and a good night for 'ghost sightings'. It is Louis Armstrong's trumpet playing that actually gets the ghosts to dance their way off into the night. The review: The story not only entertains, it teaches about the young life of Louis Armstrong and how his career as a trumpet player began with the early gigs aboard the Mississippi Steamboats. Osbourne includes real ghosts in the story! My son was on the edge of his seat. She breifly and cleverly brings in the subject of racism that existed during that time as compares it to today, where an African American is the President of the United States. Thoughtfully, She uses titles of the songs that Louis Armstrong recorded in his career as chapter titles, and like music, the story flows along with ease. My son really enjoyed the book. I appreciated how it presented a mini-history lesson of Louis Armstrong and New Orleans, while still being thoroughly entertaining. I understand why Mary Pope Osborne has reached #42 in this best-selling series. I just picked up more of the series yesterday. We will read Pirates Past Noon #4, next. I can't wait until he tells me, "Mom, I am going to read this one to you!" Kid's Say the Darnedest Things! Kid's do say the darnedest things, especially when you tell them too! In this short video, Will Ferrell finds himself up against Pearl, the nastiest, two-year-old landlord around. Adam McKay, also appearing in the video, is Pearl's Dad who helped her "learn her lines". If Pearl remembers getting this kind of reaction from people just by saying a few off-color words, she will become the next Sara Silverman! It has been out for a couple of years, but if you haven't seen it, check it out for a good laugh. The out takes are just as funny! "Ahhh, they grow up too fast, don't they?" I am thinking this is what the owners of the "teacup pig" are saying to each other after about a year of acquiring one (or two) of these petite pink pigs. Truth be told, after a year, the teacup pig will grow to the size of an average dog, about 12-16" high, and weigh in at 65 lbs. Time to replace the teacup with a medium-sized crate! According to the breeder on the Today Show, the teacup pigs do need a lot of attention and shouldn't be left home alone. As a matter of fact, she claims to only sell them to people who either buy two or already have a companion pig to keep the new pig company. So, I guess that means two medium-sized crates! How many times have you heard that pigs were "very clean animals?" Growing up, I had a friend who lived on a farm and her family raised pigs. I remember the stink of that pink pen enveloping the entire 100 acres of their farm. Pink? I thought all pigs were brown. Every time I saw them, these mammoth, gluttonous creatures were either eating or lying in the pen, covered from head to toe with a layer of mud with either their own or their mate's c-r-a-p mixed in. The word "clean" does not come to mind. While these animals may not be my "cup of tea" (sorry had to do it). You can learn more about them by watching this Today Show video. Aloha Friday - Disney's A Christmas Carol? Happy Aloha Friday!! From Kailani at An Island Life: In Hawaii, Aloha Friday is the day that we take it easy and look forward to the weekend. So on Fridays let's take it easy on posting, too. Ask a simple question...nothing that requires a lengthy response. It’s a great way to make new blogging friends! Who plans on taking the kids to see Disney's A Christmas Carol in November? I believe it opens on November 6th. This was my favorite Chirstmas-time movie growing up and I think I am more excited than the kids to go see it. I am sure Jim Carey as Scrooge, will not disappoint! Happy Aloha Friday! Thanks for participating! Stop by An Island Life to check out Aloha Fridays! My mother has a great recipe for homemade baked beans, but I just couldn't justify the time it took to soak the beans and slow-cook them all day. For my son's 5th birthday, we had a cook-out and I added a few simple ingredients to some canned baked beans and came up with this recipe. It was a hit! This recipe requires about 15 minutes of prep. time and 45 minutes of cook time. For the great taste of home-made baked beans in less time, this baked bean recipe is sure to please! Pre-heat the oven to 375 degrees F. Place the baked beans in a 12 x 8 x 2-inch baking dish and set aside. Place the bacon in a stack and chop it into 1/2" size pieces. Heat a large non-stick skillet over medium heat. Add the bacon and saute' until crisp. Remove the bacon to a plate. There should be approximately 2 Tablespoons of grease left in the pan. Place the onion in the pan and saute' until tender, stirring occasionally, about 3 - 5 minutes. Remove the pan from heat. Add the onion, bacon, light brown sugar, Worcestershire sauce and French's Yellow Mustard to the beans and stir until combined. Baked covered at 375 degrees F for 30 minutes. Uncover and bake for 15 more minutes until bubbly. To enter one of your favorite recipes into the French's 2009 cookoff contest, click here! From the Amazon website: Create a comforting environment. This Am/Fm clock radio has 6 peaceful natural sounds to choose from: Ocean, Summer night, Rainforest, Waterfall and Thunder & lightning. The LCD readout display projects the time in soothing blue light. 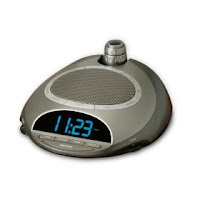 Wake to natural sounds, radio or beep tones. Also includes a handy snooze button. The Review: I originally bought this radio from Linens & Things three years ago. (Remember Linen's & Things? What a neat store!) I read that using white noise is a simple way that would help me to get a good night sleep, so I bought this sound machine/radio with that in mind. My preferred sound is the rain. It's soothing, just like the real thing. Even my husband can't live without our sound machine, and he suggested getting this same one for the kid's room. We usually have a fan going in their room, but now with the cold weather approaching, it's time to put away the fans. As the sound of a running fan is another form of white noise, the kids have grown accustomed to white noise as well. This sound machine has an AM/FM radio that has great reception. I like to have the radio on when I am cleaning and it is so light and portable, I take it room to room. There is a projection light that I leave off, because it is too bright for me, but you may like the fact that it will project the time on your ceiling for easy reference. This sound machine comes with us whenever we go away overnight. I really appreciated the way it drowned out all the outside noise when we went camping (in a tent) with the kids! I don't think any of us would have slept as well as we did without this handy little sound machine. The price is right at under $20. This has become one of those "things" I couldn't do without! Is chopping down a pine tree and displaying it in your living room a holiday tradition or the behavior of a drunk man? Easter is the day Jesus rose from the dead. How do we celebrate? By hiding eggs. Don’t follow the logic? Don’t worry there’s a bunny! What’s our Thanksgiving tradition? We overeat. But we do that every day! Correction, we overeat with people we can’t stand! What about Halloween, is it just an excuse for us moms to dress up like prostitutes? Check out Jim Gaffigan’s funny you tube video clip on holiday traditions and have a good laugh! I've been awarded for the first time! I recently received the Best Blog Award from Anitra at The Mama Zone. Thank you Anitra! Please go check her blog out! I am new to this and she has already proven to be a good blog-friend to have and I enjoy reading her blog! Thank you again for the award! A big thank you to all who stop by! When I heard the first radio advertisement for Th-121 as an anti-aging supplement that promised weight loss with no side effects, I admit I was interested. The product sounded wonderful! Take only two pills a day, with no anxiety or jittery side-effects, and drop that last twenty (or thirty) pounds. Maybe this Th-121 was finally the secret to weight loss that the whole world was waiting for! Th-121 is a weight loss supplement that is a registered trademark of Chamonix, a company that manufactures anti-aging skin care and weight loss products. The Chamonix website is called Better Skin Today. Chamonix does not use mineral oil, petroleum by-products, pharmaceutical preservatives, coloring agents or other harmful ingredients, and they never test on animals. Chamonix uses only pure, natural ingredients, including a variety of potent antioxidants. The Chamonix anti-aging skin care products are developed by a pharmacist, and are clinically proven to work. Like the Chamonix anti-aging skin care products, which are formulated on the basis that antioxidants are the key to preventing premature aging, the Chamonix line of anti-aging weight control products (like Th-121) are formulated on this same premise. When it came to designing my own website, blog and button, I thought I could do it myself. The end result was a pretty boring, unprofessional looking website and blog. My friend suggested that I talk to Melanie at Mommydoodles and let her take over the design aspect of my website and blog. I hesitated for a bit, but I finally emailed Melanie at Mommydoodles to ask her to help me out, and I am so glad that I did! Mommydoodles re-designed my website kristimaloney.com and this blog. She did a fantastic job on the transfer, the designs, the headers, the button and my signature. She offers more great services too! She can help you with your logo designs, favicons, twitter graphics, wordpress headers, custom vinyl graphics, and all at an affordable price. So I want to thank Mommydoodles and I want to urge you to check out her website/blog, drop her an email. and tell her what you need. You'll be amazed at what she can do for you! Are you selling your house? Were you thinking of taking it off the market for the winter? You should wait until November 30th. Why? According to Massachusetts real estate agents, first time home buyers are anxious to take advantage of an $8,000 tax credit scheduled to expire next month. (November 2009). Under the gun, many first time home buyers are actually creating bidding wars on lower-priced homes! We aren’t holding our breath for a bidding war on our lower-priced Massachusetts home (on the market since May) but we have decided to keep it listed until mid November because of this tax credit. The tax credit incentive is a faint light of hope at the end of what has been an extremely dark housing market tunnel. This may be just enough of a boost for selling your house too.